If commitlog archiving is enabled on a cluster, OpsCenter does not automatically enable commitlog archiving on the new nodes when adding new nodes to a cluster using Lifecycle Manager. 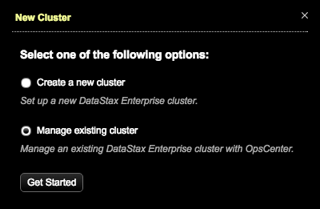 If you add nodes to a cluster and commitlog archiving is enabled, you must manually copy commitlog_archiving.properties to the new nodes prior to starting DataStax Enterprise, or re-enable commit log archiving. If you are not using the default JMX or Native Transport ports, enter the appropriate port numbers. If required, click Add Credentials and enter the username and password for JMX or Native Transport ports. Enter the client principal for the OpsCenter process/machine to use. Example: opscenterd@YOUR_REALM. Enter the location of the keytab OpsCenter machine, which contains credentials for the opscenter_client_principal. Enter the client principal for the DataStax Agent process/machine to use. Example: agent@YOUR_REALM. Enter the location of the keytab on the DataStax Agent machines, which contains credentials for the agent_client_principal. Example: /path/to/keytab.keytab. For more information, see Authenticating with Kerberos and the Kerberos tutorial in the DataStax Enterprise documentation. If the paths are the same for the OpsCenter Keystore and Truststore (default), select My Keystore and Truststore are the same and enter the path and password. If the paths are not the same, enter the OpsCenter Keystore Path, Truststore Path, and the corresponding Password for each.